To create or verify your UCLA Logon ID, visit https://accounts.iam.ucla.edu. You will need your first and last name, your date of birth, and your 9-digit University ID (UID) number. Multi-factor authentication (MFA) is a critical safeguard against cyberattacks. It helps keep your login information out of the wrong hands by requiring two methods of login identification. UCLA uses DUO to provide MFA capabilities. All UCLA Faculty and Staff are required to enable MFA for their UCLA Logon ID. You can self-enroll in DUO and manage your device(s) through the Multi-Factor Authentication Enrollment Portal (must be on the Mednet network to access this site). If you do not have Mednet access use the UCLA Logon Multi-factor Authentication Management Tool. Additionally, you can contact Customer Care at 310-267-CARE (2273). Specialists are available 24/7 to enroll you in DUO. Health System employees when you encounter a UCLA Single Sign-On prompt, you can opt to Sign in with you Mednet username and password. This will provide you the Mednet login screen that will prompt you to enter your Mednet username and password. Health System employees on Leave of Absence must use UCLA Single Sign-On, your Mednet username and password will not work. After you click SIGN IN, you will receive a prompt to authenticate using DUO for multi-factor authentication. When you first log into the UCPath Portal, you will be prompted to verify your identity and set up five (5) security questions. Verify your identity by providing your birth date and the last four (4) digits of your social security number. 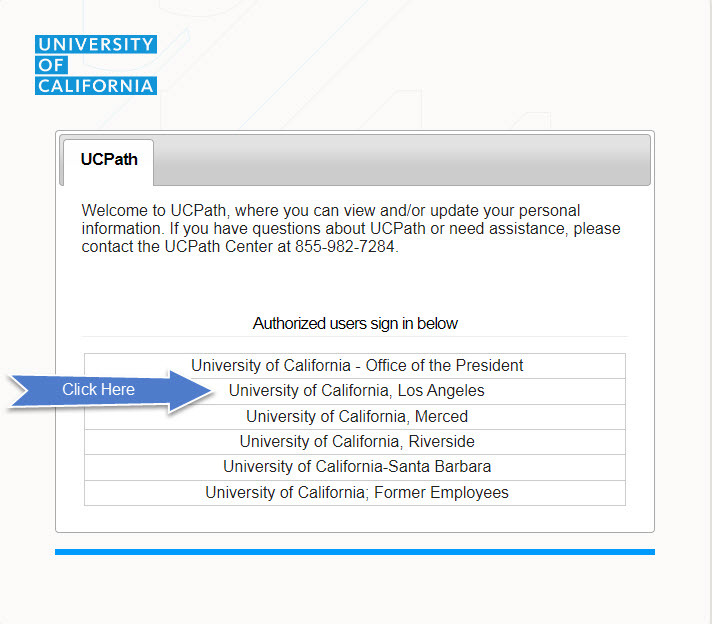 After completing this process you will be directed to your UCPath Portal Homepage. For help with your UCLA Logon contact Bruin OnLine at consult@ucla.edu or (310) 267-HELP (7-4357). For help with your Mednet User ID contact UCLA Health IT Customer Care at 310-267-CARE (7-2273) or go to IT Connect for walk-in support in the Center for Health Sciences (CHS) building.